Skills: Video and audio production, writing, communications, editing, musical composition, performance art, teaching, technical writing. Software used: Final Cut Pro Suite, Digital Performer, ProTools, FileMaker Pro, Microsoft Office, iLife, iWork, Bias Peak Pro XT, Izotope Ozone, Izotope RX, Izotope Alloy, Native Instruments Komplete, Finale, Sibelius, Photoshop CS, Reason and more. Teaching: In 1999 Buckley was among a handful of instructors training the Tucson Citizen newsroom in the use of Apple computers, which he has been using since 1992. 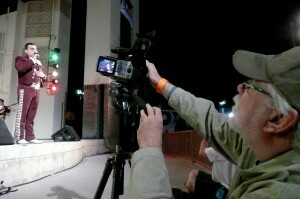 In addition he taught Citizen staffers and interns basic video production and editing. He is currently designing workshops in basic audio production for video artists.